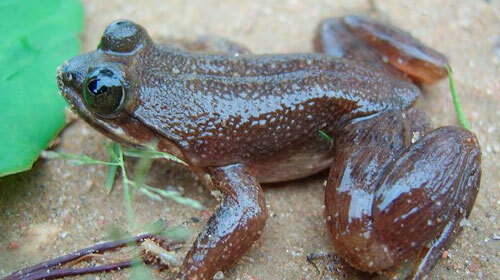 The Togo Slippery Frog is a close relative of the Goliath Frog and is usually found exclusively in Togo and Ghana. The Togo Slippery Frog is currently listed as critically endangered however the survival of these rare frogs is looking extremely bleak. The last time field research was carried out to locate the Togo Slippery Frog in Ghana there was absolutely no sight of the species, leading many to believe that the Togo Slippery Frog may have become completely extinct or at least the Ghana fragment has become extinct. 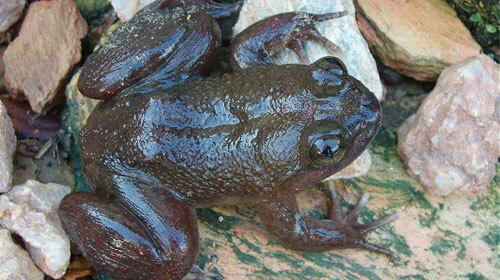 The reason for the Togo Slippery Frog possibly becoming extinct is, as usual, down to humans. Excessive human expanse and logging operations are destroying this little frogs habitat. The Togo Slippery Frog is usually found in the eastern highlands or Togo through to the western highlands of Ghana, although the Ghana population may now be extinct. The preferred habitat of the Togo Slippery Frog is forest land and rapidly flowing streams are essential to these small, rare frogs as this is where they spend most of their lives. The forest and fast flowing streams are important to the Togo Slippery Frog as this is where they live and where breeding occurs, with tadpoles being deposited in the fast flowing streams. On some occasions scientists discovered that some species of male Togo Slippery Frog did not even have a mating call which means that location is even more important than for most species when it comes to finding a mate and ensuring the survival of the species. If in the unlikely event you were to come across one of these rare frogs, luckily they are not too hard to recognize. With a large head and prominent bulbous eyes the Togo Slippery Frog’s are well distinguished and can grow up to 84mm in length. Like most frogs all the Togo Slippery Frog’s toes and fingers are webbed and they have very long muscular hind legs as opposed to small weaker front arms. Strangely the female of the species actually has smaller ear drums than the male which is unusual in frogs. The Togo Slippery Frog’s are primarily brown with a pale, almost white underside.